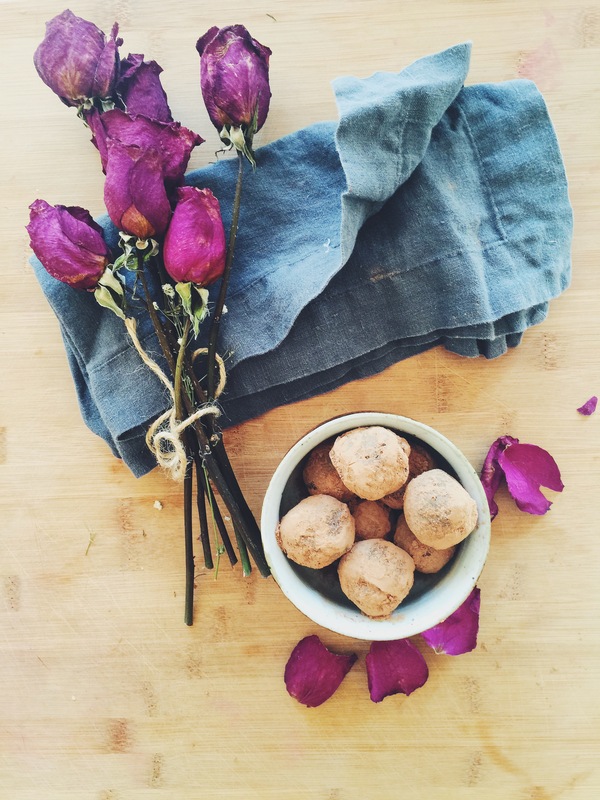 Have you ever wanted to make your own chocolate truffles but didn't know how?! This recipe is super easy (almost fool proof) and uses only five ingredients and one pot! We love these truffles for a few different reasons. First off, they are the perfect texture - soft, super rich, creamy, and magically melt in your mouth in the most decadent way. They are the perfect combination of rich dark chocolate and subtle rose. We think they'd make the perfect Valentine's day dessert for a romantic dinner or just shared with your gal pals or co-workers for a mind blowing treat that is packed with nutrients! They can be stored at room temperature which make them easy to give as a handmade gift wrapped in foil or in a pretty box. Did you know rose essential oil is the highest frequency food of any natural substance? What does that mean exactly?! To keep it simple, every thing has a frequency because everything vibrates (because everything is made of atoms!). You, me, plants,etc. The human body = 62-72 MHz (unit of measurement), rose = 320 MHz! Think of it as concentrated life force. Consuming it or smelling it can helps raise your vibration (which improves health and immunity). Rose oil is known to be a natural antidepressant, aphrodisiac, and anti-viral and more. We use a teeny tiny bit in a whole batch of chocolate, so don't worry, you wont vibrate away but we do hope you enjoy the health benefits and uplifting qualities of rose. 1. Start by getting all the ingredients prepared, chop the chocolate bar and measure out the ingredients. The next process uses the heat from the coconut oil in step 2 to melt the rest of the ingredients. So you'll need those ready to go, in order to not have to reheat the chocolate (which can compromise the integrity of the chocolate). 2. Melt the coconut oil over low heat until it is melted and hot 1-2 minutes. 3. Take the coconut oil off the heat completely and in the same saucepan add the coconut butter and mix quickly until completely integrated. 4. Immediately add the chocolate and stir until melted. 5. Add the cacao powder and stir until combined. 6. Add the maple syrup and stir until combined. Immediately place in fridge. 7. Take the chocolate out after it is in solid form (not liquid). Use a tablespoon to scoop out a ball. Form bar with hands until you form a truffle. Place on plate and repeat until all chocolate is used. Place chocolate back in fridge for a minute. 7. Optional: Dump some raw cacao powder into a bowl. Take out the balls from the fridge and toss with the raw cacao powder until coated. Serve at room temperature. Store in the fridge covered (chocolate can take on other flavors easily) up to 14 days. *you can alternatively just use 1/4 cup coconut oil total. 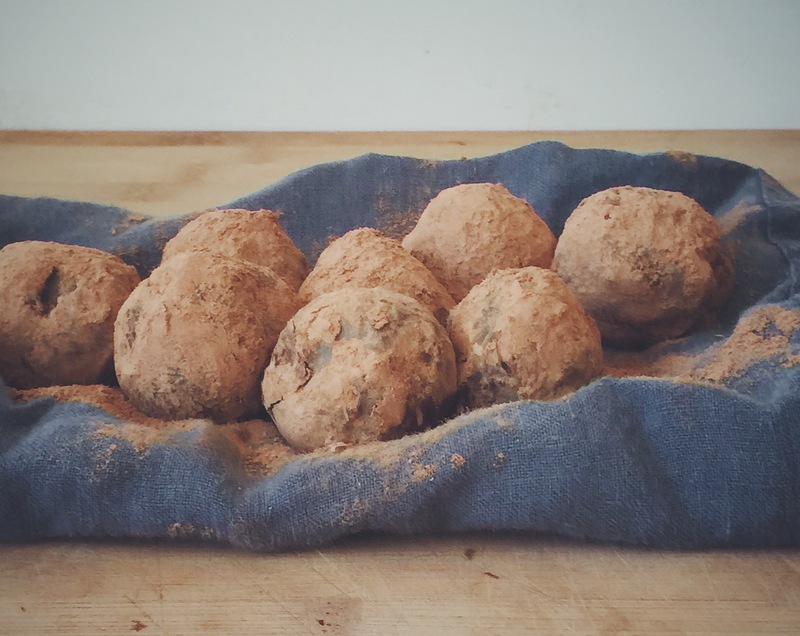 The truffles will be much softer so be sure to keep them in the fridge until you serve them. P.S. We are excited to announce that we will be a part of health expert Robyn Youkilis's Go with Your Gut book launch party with best selling author Gabrielle Bernstein! If you are in the area, its going to be a great event! You can sign up here. P.P.S. Don't miss out on our Valentine's Day limited edition bark.